Dear Jasleen, it is great to see your latest efforts that has made us learn and unlearn many things in life. I am amazed to see that at such a young age you have achieved such an unbelievable feat. Dear sister (or should I call you behenji? Not sure what is harassment and what is not, please select appropriate one) you have opened the eyes of many who still kept their eyes closed for so long. In your media interviews, choice of words, style and impeccable style of crying or complaining about harassment on a TV debate when the host asked you a question or the way you left Zee News discussion in the middle demanding harassment, was eye opener for many to learn about feminism. After all when feminists can’t reply honestly and objectively to any question, this is how they win their argument, either by crying or by complaining. I loved the way the TV anchor was taken aback. Probably next time male anchors will not dare to interview female victims like you. We have discovered some real data guys on this show. They have helped us identify the militant media and without your help this would not have been possible. Any normal person would have slapped and broken the camera of the media persons for asking those questions. Sarabjeet didn’t do that. That proved that he wouldn’t have abused you in any manner without enough provocation. This also proved that any well behaved gentleman’s life can be ruined on a simple verbal complaint. Eye opener for many men in this country. Times Now and its militant journalism was exposed in this interview again and it confirmed their terrorist agenda. 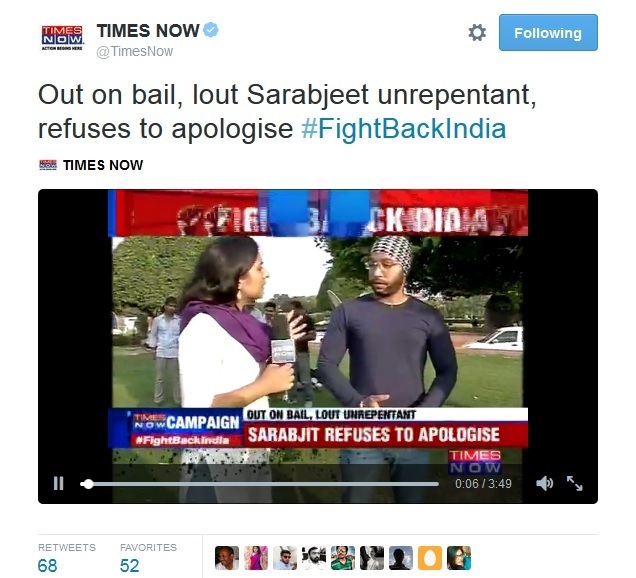 They wanted to force Sarabjeet to apologize and then brand him as criminal. Once again it was you who made this possible. Many of us had so far respected him as an IITian but after this mindless support to his party worker for narrow political gain, made us think otherwise. People understood the real enemies of this country. Thanks for making that possible. When the chief of a supposed court gives her verdict based on one sided story and ignoring the other side or without doing any investigation, that shows how pathetic is the state of our judiciary going to be in India. This DCW expose’ also proved what goes inside many of our family courts or during NCW mediated mediation shows. They decide before they hear anything in the case. Many husbands would have awaken by now with this findings. You have showed that our courts are useless. No, I am not saying this is because of the kangaroo courts run by our militant and terrorist media houses. You have shown how mindless is the decision to give court powers to DCW or NCW. When DCW chief can pronounce her verdict mindlessly on social media in favor of a girl who had done the crime, we know our Supreme Court can close down. You have shown how our Supreme Court is losing its power over our judiciary. Men in general have been mindless fools. They always fall for pretty women. Any young charming face is enough for men to forget everything else and assume that she is of good character. By your acts you have proven that they have been wrong. You have proved that women can’t be taken on their face value but men need to look for women with good hearts. May be this is the start of boon for average looking women who might be good at heart but have hard time finding a life partner. I am not sure why MRAs are protesting against your false complaint. In fact, women like you make their life easier. You send out so many message to the society that no single MRA or MRA group can achieve. I think they should be happier. Not sure. So sister, (or behenji, whatever suits you) many of us love you for teaching us so many lessons in life in such a short a span of time. Dear author, you are a complete idiot. I say this not because you have boiled down to such a sensible assessment of this episode and gave an eye-opener to all of us, but you are unable to realize your worth and wasting yourself behind the name “Annoymous”. It’s time this country need more idiots like you to hold far more authoritative position and made responsible to help people arise from their stale mentality of seeing things in just ‘black or white’. You deserve wrath and humiliation for showing mirror to people out there, who are singing praises to this girl and her heroic courage, because they cannot stand the cold and rotten reflection of their mindset. I simply praise you for righteousness and reasoning. Take pride in identifying yourself so you get your due respect.